friends who also happen to be the godparents of his son. This week - in 2017 - one of those donations was listed in godfather Paul Manafort's long-delayed filings of his work on behalf of the pro-Russian political party that controlled Ukraine's government. Manafort was Donald Trump's Campaign Manager for a period in 2016, and is a key figure in the ongoing investigations into ties between Trump (and his campaign), and Russia (and Russian interests). This week, he belatedly filed required Foreign Agents Registration Act ("FARA") documents with the U.S. Department of Justice, indicating that he had received more than $17M in two years from the Ukrainian client. Sure enough, the contribution shows up in Parker's FEC (Federal Election Commission) report, as being a personal contribution from Manafort. As it turns out, over the years, Parker has received more contributions (nearly $10,000) from Manafort and his wife Kathy than any other candidate for federal office received (including Trump, McCain, Bush, and the few Congressional candidates the Manaforts supported). Parker told Arizona's Politics this afternoon that the contributions had nothing to do with Manafort's work with the Ukrainian party. "At no time have I ever discussed Ukraine, Russia or any other foreign entity with Paul... our relationship has always been personal." "I met Paul Manafort through his wife Kathy Manafort. I was editor-in-chief of the Georgetown University "American criminal law review": Kathy was on the law journal. We have been family friends of theirs for nearly 30 years. We had our wedding reception at their home 26 years ago. Paul and Kathy Manafort are our son's God Parents." Arizona's Politics - which has reported on Parker several times through his two runs for Congress and one for the Arizona Corporation Commission - asked Parker whether he had any thoughts about the investigations that Manafort now finds himself embroiled in. The local business consultant stated. "Theoretically, we are always presumed innocent until proven guilty...my wife and I have known Paul and his wife Kathy on a personal level. They have been friends for many years and will remain our friends." Here is the draft bill that the Senate will be moving forward on to repeal and replace Obamacare. They are calling it the ‘‘Better Care Reconciliation Act of 2017’’. Senator John McCain (R-AZ) took President Trump's nominee for Deputy Defense Secretary in front of the Congressional woodshed this morning, for being too non-committal about providing defense weaponry to Ukraine. Former Boeing executive Patrick Shanahan verbally agreed today that the U.S. should assist Ukraine as the tensions between that country and Russia continue to be high. His change from his written responses caught McCain by surprise, but that did not prevent the Chair of the Senate Armed Services Committee from finishing the scolding and threatening to stop his confirmation process. McCain: "Your answer was, I'd have to look at the issue. That's not good enough, Mr. Shanahan. I'm glad to hear you have changed your opinion from what was submitted. But, it is still disturbing, it is still disturbing to me that after all of these years, you would say that you would have to look at the issue....Have you not been aware of the thousands of people that have been killed by Vladimir Putin. Have you missed all that...?" Shanahan: "No, Chairman, I am aware of that." McCain: "Not a good beginning. Not a good beginning. Do not do that again, Mr. Shanahan, or. I. will. not. take. your. name. up. for. a. vote. before. this committee. Am I perfectly clear? WATCH: Arizona Rep. McSally: "We Need To Look Within Our Hearts And Make Sure We're Not Being Facilitators Or Bystanders"
Arizona Rep. Martha McSally (R-CD2) took to the Saturday airwaves from Tucson on both Fox News and MSNBC to try to get everyone to "ratchet down" the record-approaching political temperature. She included herself in preaching that "we need to look within our hearts and make sure we're not being facilitators or bystanders." We spoke with Barber on Wednesday, covered Rep. David Schweikert's national comments on Thursday, and an interview with Rep. Trent Franks yesterday after it was learned that he may have been an eventual target of the Congressional baseball practice shooter. As we said yesterday, such a streak will likely have to continue for many more months before it might start to really make a difference in the current political climate and next year's elections. Here's to hoping. Here are McSally's interviews on both networks. President Donald Trump has hired big name attorney John Dowd to join his personal legal team as he battles various investigations focusing on possible ties to Russia, obstruction of justice, and related issues. Dowd is well-known to Arizonans, as he previously served as counsel for Senator John McCain and former Governor Fife Symington in the 1990's. Dowd, now 76, joins Trump's longtime personal attorney Marc Kasowitz and Jay Sekulow as the most senior members of the growing legal team. He has been both prosecutor and defense attorney over the years. He represented Sen. John McCain in the Arizona-centric Keating Five scandal in the early 1990's. Of the five Senators, McCain was personally closest to the land developer/S&L CEO, Charles Keating, Jr. However, after a lengthy Senate Ethics Committee, McCain was cleared, with only official criticism of his poor judgment for intervening for the large campaign contributor (and personal vacation-sharer). Former Arizona Governor J. Fife Symington was not quite as fortunate. Dowd defended him in the trial for extortion and bank fraud. He was convicted on several counts of the latter, and resigned from office. The conviction was then reversed on appeal and he was pardoned by President Bill Clinton before any retrial could occur. Arizona's Politics has asked the Senator for comment on Trump's hiring of his former counsel, and will update as warranted. McCain has fretted publicly about the President's comments and actions concerning the investigations and fiercely criticized any friendliness toward Russian President Vladimir Putin. The President filed his updated his personal financial disclosure statements and one item jumped out at me: somehow, Donald J. Trump made some money on his long-defunct Trump University last year while the former students waited for their refunds from the $25M court settlement. In fact, the $38,542 in declared income almost matches the amount that former student Boyce Chait was owed* when he passed away this past January. How the President was able to extract any money from the long-gone and under siege Trump U (later renamed the Trump Entrepreneur Initiative) is a mystery, although one that might have been explained in the class-action litigation that was settled shortly before it was to go to trial. In his previous financial disclosure statement, filed in 2015 after he announced his candidacy, indicated that he had received $11,819 in income from Trump University. The settlement was approved in March, although payments are on hold because of an appeal by one of the former students. *The USA Today report indicates that he had paid $34,995 in "tuition", and that the settlement would pay back some "90 cents on the dollar". Arizona Rep. Trent Franks (R-CD8) carefully confirmed that he has been contacted by the FBI about the investigation into Wednesday's mass shooting at a Republicans-only baseball practice. "And yes, that I might be involved in that investigation." Fox News and other media are reporting that the FBI found a list of six GOP Congressmen on the shooter's body, and that Franks is one of those. Franks spoke carefully with Fox News' Martha MacCallum (below), and preached that "we have to speak to the issues facing us with a principled persuasion rather than just screaming at each other." "We solve our problems by ballots, not with bullets," he added. This is the 3rd day in a row that Arizona's Politics has reported on Arizona Congressmen or former Congressmen opining about the political rhetoric. Former Congressman and a victim from the most recent political mass shooting (in Tucson) aimed at a Member of Congress Ron Barber spoke with us eloquently on Wednesday, and Rep. David Schweikert (R-CD6) spoke on NPR about bins of hate referencing his young daughter yesterday. Such a streak will likely have to continue for many more months before it might start to really make a difference in the current political climate and next year's elections. Here's to hoping. The new watchdog group American Oversight filed a FOIA lawsuit today to obtain government plans and analyses regarding the border wall that President Donald Trump made a cornerstone of last year's campaign. The suit is partly focused on Arizona's portion of the border that would be on land that is part of the Tohono O'odham nation. DOI: Communications and analysis from the Bureau of Land Management (BLM) related to the wall’s impact on the Tohono O’odham Nation. DHS: Communications from DHS with, and related to, the Tohono O’odham Nation. DHS: Analysis of the impact of the border wall on the Tohono O’odham Nation. The communications include any contacts the federal government has had with the Tohono O'odham Nation or its lobbyists. The Nation has one of the largest lobbying contracts in Washington, although until recently, much of that was focused on the battle to open up the heavily contested casino west of Phoenix. LISTEN/READ: Arizona Rep. Schweikert's Received "Bins...Of Vile Hate...Going At My Little Girl"
Arizona Rep. David Schweikert (R-CD6) said today that he has received "bins" of hate messages directed at his daughter. Earlier in the same interview, he said that President Donald Trump has not learned "the disciplined use of language and what certain words mean in (political) context." Schweikert "sort of" acknowledged that his comments about the President seem "sort of odd coming from sort of a conservative libertarian", but that he thinks it is reasonable for Special Counsel Robert Mueller to be looking into possible efforts to obstruct justice. Schweikert made his remarks on NPR's Morning Edition program today, and noted that he was supposed to be at the practice where the mass shooting injuring House Majority Whip Steve Scalise and four others took place. * He went on to note that he and other GOP House members have been talking about "the ocean of sort of vile sort of hate that has come running into our social media, into our mailboxes and taped to our doors and even mailed to home." The eye-opening part of that is that Schweikert stated that his recently-adopted young daughter has not been immune from the vitriol. "we have bins where they they're even going at my little girl." INSKEEP: You've received messages referring to your daughter? SCHWEIKERT: Yeah. And it just shows you there's something that's become toxic in the souls out there. Yesterday, Arizona's Politics reported on comments from former Rep. (and mass shooting victim) Ron Barber, calling on everyone to stop the "political rhetoric and harsh vitriol" that has created such an environment. Schweikert was elected to Congress in 2010, defeating Harry Mitchell in a campaign that focused on the passage of Obamacare (the Affordable Care Act). However, he typically personally refrains from the incendiary rhetoric that others engage in - both supporting and opposing him. * In a funny flip from Arizona Sen. John McCain's explanation last week, Schweikert says he missed baseball because he overslept due to time zones. Former Rep. Ron Barber: "Political Rhetoric and Harsh Vitriol Which Creates This Environment Just Has To Stop"
Former Arizona Congressman Ron Barber has a unique perspective - and many thoughts - on today's shooting of House Majority Whip Steve Scalise and four others at the Republican baseball practice in Virginia. The bottom line is that he is amplifying his call for civility, and for an end to the "harsh vitriol" that dominated the 2016 campaign and since. "We need to have the kind of political leadership from the White House on down, and the political rhetoric and harsh vitriol which creates this environment just has to stop," Barber told Arizona's Politics this afternoon. Barber was the District Director for Arizona Rep. Gabrielle Giffords when both were shot at close range in January, 2011. Six people were killed and 16 others were hit in the last mass shooting targeting a U.S. Congressperson. He then replaced Giffords in Congress for 2 1/2 years. As a result, he knows both Scalise and Arizona Sen. Jeff Flake (witness/action-taker), and he urges people to join him in being "especially mindful of the families, in addition to the witnesses, the police and those who are personally affected." In keeping with his emphasis on mental health before and after his political experience, Barber urged Scalise and the others to seek out counseling services to deal with today's events. "I did, and I hope they do, too." Barber notes that he knew Flake well and spoke with him many times - both because Flake and Giffords were friends and because they were part of Arizona's Congressional delegation. Noting how Flake immediately drove to Tucson and spent that January Saturday at University Medical Center during Giffords' struggle to survive being shot in the head, Barber says "I know (the 2011 mass shooting) had to effect him. He has a big heart and is a good person. (But) this may effect him more today because he witnessed it." "My call then and my call today: more civility in public discourse," Barber concluded. Courtesy of CNN, Arizona Senator Jeff Flake describing the shooting scene this mornng. It was no surprise that Sen. Flake was present at the Republicans' practice. He has participated in the annual Congressional Baseball Classic for many years. Democrats are claiming that the President is violating the Constitution's Foreign Emoluments Clause by not obtaining Congress' permission before accepting monies from foreign governments in his hotels, office towers and more. Arizona's other two Democratic Representatives - Kyrsten Sinema (D-CD9) and Tom O'Halleran (D-CD1) did not sign on to the case being filed in U.S. DC District Court. Nationally, 166 of the House's 194 Democrats are participating, as are 30 of the 46 Democratic Senators. The Representatives and Senators are reportedly splitting the litigation costs, and are paying out of their pockets or their campaign committee's coffers. This afternoon, the Phoenix City Council unanimously approved paying $2M this year, so that the Gila River Indian Community will give up some of its Colorado River water allocation and leave the water in Lake Mead. Arizona's Politics reported yesterday on the agreement - which also includes the federal and state governments and the Walton Family Foundation. Here is the overwhelmingly positive news release from the City after the vote this afternoon, with quotes from your favorite Mayor or City Councilmember (and more). PHOENIX – Mayor Greg Stanton and the Phoenix City Council today unanimously approved an agreement with tribal, state, federal and philanthropic leaders to help protect the Colorado River and preserve water levels in Lake Mead. The agreement with State of Arizona, the Gila River Indian Community, the U.S. Bureau of Reclamation, and the Walton Family Foundation will save the equivalent of 35 percent of the Colorado River water used by Phoenix residents each year. Specifically, it will fund a contribution of 13 billion gallons of Colorado River water to system conservation in Lake Mead this year. The Colorado River – essential to Arizona’s water supply – is over-allocated and regarded as one of the most endangered rivers in the nation, and Lake Mead is at 40 percent capacity. To preserve the state’s long-term water supply, cities like Phoenix must take a more active and leading role, said Stanton. System-wide solutions like this agreement establish a long-term partnership between tribal, federal, state and local leaders and a philanthropic foundation that helps conserve precious water resources in Lake Mead. Under the agreement, the Gila River Indian Community will contribute 40,000 acre-feet of its Colorado River allocation to system conservation. The City will contribute $2 million towards the program. While the financial commitment in this agreement is for one year only, it is anticipated that the State of Arizona, the City of Phoenix, the Walton Family Foundation, and others may continue those contributions into the future to develop a regional system conservation program that will be open to additional water contributors and additional funders. "Phoenix is a leader when it comes to smart, water supply planning, which is vital for our city's future," said Councilwoman Debra Stark. "As someone with a planning background, I know the importance of coming up with creative solutions for real issues. This agreement is a great partnership that has led to an innovative water conservation system." "I was part of the original water settlements for the City," said Councilman Sal DiCiccio, “And it's critical we continue to move forward with our conservation efforts. I am proud to support this innovative agreement that helps protect Phoenix's precious Colorado River water supply." Funding for Phoenix’s portion will come from the Colorado River Resiliency Fund, which was approved by the Phoenix City Council in 2014. The Colorado River Resiliency Fund supports projects focused on water supply resiliency, including system conservation efforts. Tucson physician Matt Heinz announced today that he will try again to unseat Rep. Martha McSally (R-CD2). He lost to her by a margin of 54% to 46% last year. Of course, McSally herself took two tries to gain the hotly-contested, "swing" district in southern Arizona. The incumbent that she defeated in 2014 - Ron Barber - is now leading an effort to draft Ann Kirkpatrick (another former Representative) to lead the Democratic charge next year. Heinz raised (and spent) nearly $1.6M in the 2016 campaign. McSally currently has $631,000 stashed in the bank for the 2018 campaign. And, of course, it is almost guaranteed that outside groups will once again spend heavily on both sides in this toss-up district. Mitch – first, I wanted to say thank you. Last year, your support made it possible for me to take on Martha McSally. Even though we didn't get the outcome we had hoped for, I was honored to have you by my side every step of the way. Which is why I wanted you to be the first to know that I’m running again to defeat Martha McSally in 2018. But I can’t do this without you. We need to show Martha McSally that we’re in it to win, so I’m hoping we can get 100 founding members to join my campaign in the next 24 hours. Take a minute to watch why I’m running and then will you please chip in $5 or more right now to get my campaign off the ground? Chip in $8 to become a founding member! Chip in $15 to become a founding member! Chip in $35 to become a founding member! Chip in $75 to become a founding member! Since the election, Martha McSally’s approval rating has dropped significantly. 53% of her constituents disapprove of the job she is doing. In the latest head-to-head polling, I’m beating her 48% to 44%. This race is winnable in 2018, but only if I have the same support and buy-in from you that I did last year. With a grassroots movement behind me, I’m more confident than ever that we can turn the tide next year. The Walton Family Foundation is entering into an agreement with federal/state/local/tribal governments to help conserve Colorado River Water. The Phoenix City Council is set to approve its portion of the agreement tomorrow. The various governments and the Foundation are paying the Gila River Indian Community $175/acre-foot to give up its rights to 40,000 acre-feet of Colorado River water this coming year. The water will stay above Hoover Dam and will stabilize the levels in Lake Mead. The Foundation from the founders of Wal-Mart are kicking in $1M, while Phoenix, Arizona and the U.S.contribute $2M each. The Gila River Indian Community has already approved the agreement, and the Phoenix memo says that similar agreements in future years are anticipated. The Walton Family Foundation states (in its Annual Report) that it made $21.6M in grants in 2016 to Colorado River water-related groups and projects. The City of Phoenix and the Gila River Indian Community also entered into a 2nd agreement this year that leaves 3,800 acre-feet of Phoenix's water in the Central Arizona Project Canal, which the Indian Community will divert into the Gila River. That water will be stored underground and Phoenix will receive credit for it for future needs. When that 2nd agreement was approved, Phoenix Mayor Greg Stanton called it a "win-win for everyone" and said "solving our most difficult long-term water challenges like the over-allocation of Colorado River water will require innovation and collaboration, Today we are embarking on a creative new way for the Gila River Indian Community, Phoenix, and others to help build drought resiliency together to protect the Colorado and Lake Mead for the long run." The Arizona Diamondbacks ownership was able to distribute dividends to its investors in the 4.7%-9.3% range in 2016. This appears to be the first such distribution in several years. 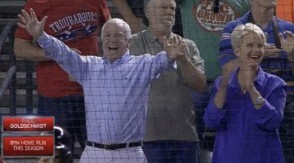 Arizona Senator John McCain (R-AZ) is a longtime minority owner of the Diamondbacks*. More accurately, his wife Cindy owns the share; however, Senator McCain must list that interest in his annual personal financial disclosure. His new financial disclosure statement not only showed that the McCain's still own there share, but also that owners received a hefty dividend from the D'backs in '16 - the 1st time in years. Ms. McCain's interest is listed as being worth between $500,001 and $1,000,000. It also lists a "distributive share of ordinary income" of $46,564. That calculates to the 4.7-9.3% range for the dividend. McCain's previous financial disclosure statements (filed 2013-2016) reflect zero (less than $200) in distributions. Forbes reported that the Diamondbacks took in $223M in revenue in 2015 and that the value of the team is now approximately $925M. In a related note, Arizona's Politics is simultaneously publishing an update on the Diamondbacks' efforts to convince the court to cancel the rest of its long-term lease with Maricopa County to play at Chase Ballpark. *This research and article was prompted by Sen. McCain half-jokingly blaming his apparent confusion at today's hearing with former FBI Director James Comey on watching a marathon D'backs game last night. A June 28 hearing was set today on Maricopa County's Motion to Dismiss the lawsuit filed by the Arizona Diamondbacks' ownership in an effort to get out of their lease for taxpayer-owned Chase Ballpark. Maricopa County Superior Court Judge Karen Mullins has reserved one hour for oral arguments on the County's motion. The Diamondbacks filed the legal action in January (read complaint at link) asking the Court to let the team out of its long-term lease early due to the County's alleged failure to keep up on promised repairs. The County hired outside counsel (Cameron Artigue from Gammage & Burnham) and filed the pending motion to dismiss the action. In a related note, Arizona's Politics is separately reporting that the Diamondbacks were apparently able to distribute monies to investors in 2016, for the first time in several years. Arizona Senator John McCain (R-AZ) released a statement this afternoon acknowledging that his questioning of former FBI Director James Comey was less than artful. The 80-year old Senator who was re-elected last year blamed a late night watching the Diamondbacks-Padres game. WATCH/READ: Senator McCain's Questioning of Fmr FBI Director James Comey; What Was "That Thing"? Here is the video and the transcript of Arizona Senator John McCain's turn at questioning former FBI Director James Comey during today's public Senate Intelligence Committee. >> SENATOR McCAIN. IN THE CASE OF HILLARY CLINTON, YOU MADE THE STATEMENT THAT THERE WASN'T SUFFICIENT EVIDENCE TO BRING A SUIT AGAINST HER ALTHOUGH IT HAD BEEN VERY CARELESS IN THEIR BEHAVIOR. BUT YOU DID REACH A CONCLUSION IN THAT CASE THAT IT WAS NOT NECESSARY TO FURTHER PURSUE HER. YET, AT THE SAME TIME, IN THE CASE OF MR. COPY, YOU SAID THAT THERE WAS NOT ENOUGH INFORMATION TO MAKE A CONCLUSION. TELL ME THE DIFFERENCE BETWEEN YOUR CONCLUSION AS FAR AS FORMER SECRETARY CLINTON IS CONCERNED AND MR. TRUMP. >> BUT IT'S STILL ONGOING. >> CORRECT. SO PFAFF AS I KNOW. IT WAS WHEN I LEFT. >> THAT INVESTIGATION WAS GOING ON. THIS INVESTIGATION IS GOING ON. YOU REACH SEPARATE CONCLUSIONS. >> NO THAT ONE WAS DONE. >> THAT INVESTIGATION OF ANY INVOLVEMENT OF SECRETARY CLINTON OR ANY OF HER ASSOCIATES IS COMPLETED? >> YES, AS OF JULY 5th, THE FBI COMPLETED ITS INVESTIGATIVE WORK AND THAT'S WHAT I WAS ANNOUNCING WHAT WE HAD DONE AND WHAT WE HAD FOUND. >> WELL, AT LEAST IN THE MINDS OF THIS MEMBER, THERE'S A WHOLE LOT OF QUESTIONS REMAINING ABOUT WHAT WENT ON PARTICULARLY CONSIDERING THE FACT THAT AS YOU MENTIONED, AS THE A "BIG DEAL" AS TO WHAT WENT ON DURING THE CAMPAIGN. SO I'M GLAD YOU CONCLUDED THAT PART OF THE INVESTIGATION, BUT I -- I THINK THAT THE AMERICAN PEOPLE HAVE A WHOLE LOT OF QUESTIONS OUT THERE, PARTICULARLY SINCE YOU JUST EMPHASIZED THE ROLE THAT RUSSIA PLAYED. AND OBVIOUSLY, SHE WAS A CANDIDATE FOR PRESIDENT AT THE TIME. SO SHE WAS CLEARLY INVOLVED IN THIS WHOLE SITUATION WHERE FAKE NEWS, AS YOU JUST DESCRIBED IT, BIG DEAL TOOK PLACE. YOU'RE GOING TO HAVE TO HELP ME OUT HERE. IN OTHER WORDS, WE'RE COMPLETE THE INVESTIGATION OF ANYTHING THAT FORMER SECRETARY CLINTON HAD TO DO WITH A CAMPAIGN IS OVER AND WE DON'T HAVE TO WORRY ABOUT IT ANYMORE? SLUFGING. > WITH RESPECT TO -- I'M A LITTLE CONFUSED. WITH RESPECT TO SECRETARY CLINTON, WE INVESTIGATED CRIMINAL INVESTIGATION IN CONNECTION WITH HER USE OF A PERSONAL E-MAIL SERVER. >> I UNDERSTAND. >> I UNDERSTAND. >> THAT'S THE INVESTIGATION I ANNOUNCED THE CONCLUSION OF ON JULY 5th. >> SO BUT AT THE SAME TIME, YOU MADE THE ANNOUNCEMENT THERE WOULD BE NO CHARGES BROUGHT AGAINST THEN SECRETARY CLINTON FOR ANY ACTIVITIES INVOLVED IN THE RUSSIA INVOLVEMENT IN OUR ENGAGEMENT IN OUR ELECTION. I DON'T QUITE UNDERSTAND HOW YOU COULD BE DONE WITH THAT BUT NOT DONE WITH THE WHOLE INVESTIGATION OF THEIR ATTEMPT TO AFFECT THE OUTCOME OF THE OUR ELECTION. >> NO, I'M SORRY. WE'RE NOT AT LEAST WHEN I LEFT WHEN I WAS FIRED ON MAY 9th, THERE WAS STILL AN OPEN INVESTIGATION TO UNDERSTAND THE RUSSIAN EFFORTS AND WHETHER ANY AMERICANS WORKED WITH THEM. >> BUT YOU REACHED THE CONCLUSION THERE WAS NO REASON TO BRING CHARGES AGAINST SECRETARY CLINTON SO YOU REACHED A CONCLUSION IN THE CASE OF MR. COMEY, THE PRESIDENT -- >> NO, SIR. >> NO, SIR. >> IN THE CASE OF PRESIDENT TRUMP, YOU HAVE AN ONGOING INVESTIGATION. SO YOU GOT ONE CANDIDATE WHO YOU'RE DONE WITH AND ANOTHER CANDIDATE THAT YOU HAVE A LONG WAY TO GO. IS THAT CORRECT? >> I DON'T KNOW HOW FAR THE FBI HAS TO GO, BUT YES. THAT THE CLINTON E-MAIL INVESTIGATION WAS COMPLETED. THE INVESTIGATION OF RUSSIA'S EFFORTS IN CONNECTION WITH THE ELECTION AND WHETHER THERE WAS ANY COORDINATION AND IF SO WITH WHOM BETWEEN RUSSIA AND THE CAMPAIGN WAS ONGOING WHEN I LEFT. >> YOU JUST MADE IT CLEAR THIS WAS A BIG DEAL, UNQUOTE. I THINK IT'S HARD TO RECONCILE ONE CASE YOU REACH A COMPLETE CONCLUSION AND THE OTHER SIDE YOU HAVE NOT. AND YOU'VE IN FACT, OBVIOUSLY, THERE'S A LOT MORE THERE AS WE KNOW AS YOU CALLED A "BIG DEAL." SHE'S ONE OF THE CANDIDATES BUT IN HER CASE, YOU SAY, THERE WOULD BE NO CHARGES AND IN THE CASE OF PRESIDENT TRUMP, THE INVESTIGATION CONTINUES. WHAT HAS BEEN BROUGHT OUT IN THIS HEARING IS MORE AND MORE EMPHASIS ON THE RUSSIAN ENGAGEMENT AND INVOLVEMENT IN THIS CAMPAIGN. HOW SERIOUS DO YOU THINK THIS WAS? >> VERY SERIOUS. BUT I WANT TO SAY SOMETHING TO BE CLEAR. WE HAVE NOT ANNOUNCED AND THERE WAS NO PREDATION TO ANNOUNCE AN INVESTIGATION OF WHETHER THE RUSSIANS MAY HAVE COORDINATED WITH SECRETARY CLINTON'S CAMPAIGN. SECRETARY CLINTON'S CAMPAIGN. >> BUT THEY MAY NOT HAVE BEEN INVOLVED WITH HER CAMPAIGN. THEY WERE INVOLVED WITH THE ENTIRE PRESIDENTIAL CAMPAIGN, OBVIOUSLY. >> OF COURSE. YES, SIR. AND THAT IS AN INVESTIGATION THAT BEGAN LAST SUMMER AND SO FAR AS I'M AWARE CONTINUES. >> SO BOTH PRESIDENT TRUMP AND FORMER CANDIDATE CLINTON ARE BOTH INVOLVED IN THE INVESTIGATION, YET ONE OF THEM YOU SAID THERE'S GOING TO BE NO CHARGES AND THE OTHER ONE THAT THE INVESTIGATION CONTINUES. WELL, I THINK THERE'S A DOUBLE STANDARD THERE TO TELL YOU THE TRUTH. THEN WHEN THE PRESIDENT SAID TO YOU, YOU TALKED ABOUT THE APRIL 11th PHONE CALL, AND HE SAID QUOTE BECAUSE I'VE BEEN VERY LOYAL TO YOU, VERY LOYAL, WE HAD THAT THING, YOU KNOW. DID THAT AROUSE YOUR CURIOSITY AS TO QUOTE THAT THING WAS? >> YES. >> YES. >> WHY DIDN'T YOU ASK HIM. >> IT DIDN'T SEEM TO BE TO BE IMPORTANT FOR THE CONVERSATION WE WERE HAVING TO UNDERSTAND IT. I TOOK IT TO BE SOME -- AN EFFORT TO COMMUNICATE TO ME IN THAT THERE IS A RELATIONSHIP BETWEEN US WHERE I'VE BEEN GOOD TO YOU, YOU SHOULD BE GOOD TO ME. >> YEAH, BUT I THINK IT WOULD INTENSELY AN ROUSE MY CURIOSITY IF THE PRESIDENT OF THE UNITED STATES SAID THAT THING, YOU KNOW. I'D LIKE TO KNOW WHAT THE HELL THAT THING IS PARTICULARLY IF I'M THE HEADOF THE FBI. >> WHAT I CONCLUDED AT THE TIME IS THAT IN HIS MEMORY HE WAS SEARCHING BACK TO OUR ENCOUNTER AT THE DINNER AND WAS PREPARING HIMSELF TO SAY I OFFERED LOYALTY TO YOU. YOU PROMISED LOYALTY TO ME AND ALL OF A SUDDEN HIS MEMORY SHOWED HIM THAT DID NOT HAPPEN AND I THINK HE PULLED UP SHORT. THAT'S JUST A GUESS. I HAVE HAD A LOT OF CONVERSATIONS WITH HUMESS OVER THE YEARS. >> I THINK I WOULD HAVE HAD SOME CURIOSITY IF IT HAD BEEN ME, TO BE HONEST WITH YOU. >> ARE YOU AWARE OF ANYTHING THAT WOULD LEAD YOU TO BELIEVE THAT THE PRESIDENT OR THE MEMBERS OF THE ADMINISTRATION OR MEMBERS OF THE CAMPAIGN COLPOTENTIALLY BE USED TO COERCE OR BLACKMAIL THE ADMINISTRATION? >> THAT'S A SUBJECT FOR INVESTIGATIONS, NOT SOMETHING I CAN COMMENT ON SITTING HERE. >> BUT YOU REACHED THAT CONCLUSION AS FAR AS SECRETARY CLINTON WAS CONCERNED BUT YOU'RE NOT REACHING A CONCLUSION AS FAR AS THIS ADMINISTRATION IS CONCERNED? ARE YOU AWARE OF ANYTHING THAT WOULD LEAD YOU TO BELIEVE THAT INFORMATION EXISTS THAT COULD COERCE MEMBERS OF THE ADMINISTRATION OR BLACKMAIL THE ADMINISTRATION? >> THAT'S NOT A QUESTION I CAN ANSWER, SENATOR.